Lord Huron's songs are steeped in an adventurer's vocabulary. From the initial EPs when Ben Schneider made music on his own to 2012's debut LP Lonesome Dreams, Lord Huron's protagonist is always in tune and at odds with the elements—the darkness and light, mountains and valleys of the earth and soul both. Strange Trails, the band's latest, is similarly rooted even as they bloom with newfound confidence. Beauty abounds on most of Strange Trails, but there's no denying the central power of "Meet Me in the Woods," undeniably Schneider's best work yet. A hypnotic strum and snare combo carry the listener into the title as Schneider sings, "I took a little journey to the unknown, and I come back changed/I can feel it in my bones/I fucked with forces that our eyes can't see/Now the darkness got a hold on me." 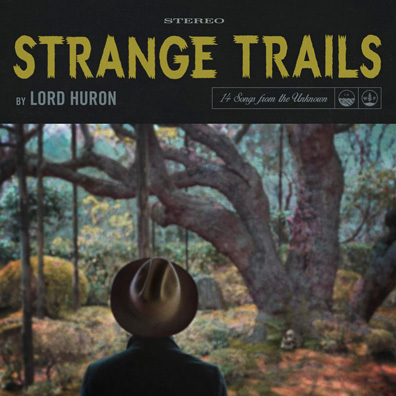 It's a captivating song in the album's center that shows how resonant Lord Huron can be. Not every trail ends at some breathtaking view, but that's understandable given the album's expansive 14 tracks. "Until the Night Turns" comes out all jangly and twisted early on, giving Ben Schneider and company an up-tempo number for the live show, but it comes off as a lame Arcade Fire knockoff. "Louisa" fades with minimal spark late in the set, a deep cut that's unnecessary in the mix. Missteps aside, Strange Trails is always beautiful, from the haunting opener "Love Like Ghosts" to the heartbreaking waltz of "The Night We Met." On the latter, Schneider sings of love lost ("I had all and then most of you/Some and now none of you...I don't know what I'm supposed to do showing that even the unwanted paths can lead us to such arresting vistas.